"Whether you feed a crowd or freeze some for later, these easy beef enchiladas with a little heat and a little sweet will be a new family favorite." Place the beef roast in a large slow cooker and cover with sliced onions, garlic, enchilada sauce, apple butter, cayenne sauce, and 1 teaspoon salt. Preheat the oven to 400 degrees F. Scoop the meat into tortillas and roll. Place each enchilada in a large 10x15-inch baking dish. Once the tortillas and meat are used up, spoon the remaining sauce over the top of the beef enchilada recipe and cover with shredded cheese. Bake for 10-15 minutes until the cheese is melted and bubbly. Serve warm with your choice of fresh toppings. 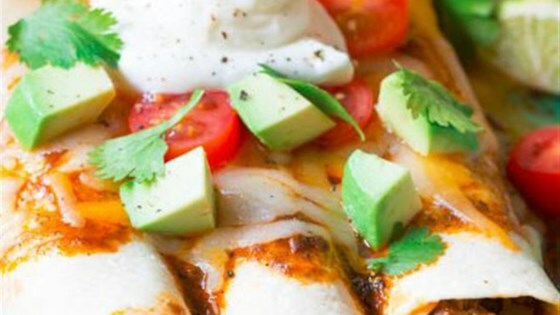 See how to put a simple twist on big, beefy enchiladas. Made these exactly as described and they were perfect Great flavor !!! My kids are VERY picky eaters and cleaned there plates. I made these as per the guidelines, they are great! Loved it! This was pretty good. I used applesauce in place of apple butter and followed other reviewers’ suggestions to use about half a cup. It wasn’t sweet at all, which was good. Absolutely delicious! Made without the apple butter and used spicy chili powder. This would have been good without the apple butter. The apple butter made it way too sweet. I am going to give it a second chance and either cut the apple butter in half or omit it all together. my husband thought it was too sweet and I thought it was too spicy. next time we will not use the apple butter and see if that helps the sweetness. Stringy meat, so-so sauce....definitely won't make again.